The award-winning Copper Chef created a safe and healthy way to enjoy the ease and versatility of non-stick cookware. From stovetop to oven to tabletop, Copper Chef will outperform every time. With its impressive heat distribution and PTFE/PFOA Free Cerami-Tech coating, even the stickiest of meals can be effortlessly wiped away. Our primary objectives were to reach their CPA goal and restructure the account for efficient performance by determining the most appropriate optimization tactics. This required a more granular structure, feed optimization and more budget allocation to the products that were contributing to a low CPA. Our first step was to create a granular account structure and a well-optimized product feed, both of which are crucial to paid search performance overall. We built the feed with all relevant shopping feed attributes, paying the closest attention to smartly-worded product titles due to the undeniable significance of relevant keywords. It’s usually best to put the most important high-volume keywords in the beginning of the titles. In this case, high-volume keywords included “Copper Chef Induction Cooktop”, and “As Seen on TV 15-pc Casserole Set.” In order to trigger branded and non-branded searches, we created branded and non-branded titles in areas where we noticed titles containing “As Seen On TV” performing like branded titles. As for account structure, we started the account with the main campaign broken out by device and a Low Bid “Catch All” Campaign. Low bid campaigns target large amounts of cheap clicks. When kept on the high campaign priority setting, low bid campaigns also allow the ads to appear on more expensive search terms. 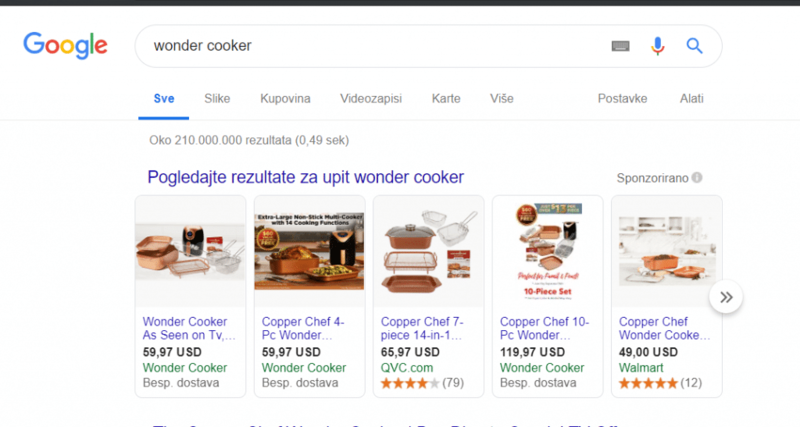 Main campaigns were created for all the Copper Chef products, as well as two other products for which the client has separate websites (Grill Mat, Wonder Cooker). For tighter control and management, main campaigns were broken out by device and kept at a high campaign priority. The next item on our list was creating a remarketing campaign that segmented our site visitors by previous site engagement. We duplicated our test campaign (which was the main campaign at this point) and targeted audiences in which all converters proved to work best. We decided to test a goal-based Smart Shopping campaign to see if it would suit our marketing strategy. All products with a CPA below our target CPA were included, with the goal of maximizing conversion value. This strategy aims to generate as much revenue as possible from a given budget. Smart Shopping Campaigns also allow for a second bidding strategy. For us, this was “Target ROAS,” which we had set slightly below our ROAS of selected products. The campaign managed to capture clicks on multiple networks (Display Network, YouTube and Gmail), in addition to search. Since the Smart Shopping campaign takes priority over existing regular shopping and dynamic remarketing campaigns, we made sure we didn’t have the same products in our main campaign and smart campaign.